This week's Flashback Friday is a lesson in perseverance in space exploration. This is a story about Ranger 6, the 15th in a line of unlucky spacecraft to sent to explore the lunar surface. This spacecraft was equipped with a number of cameras for sending back high-quality images of the lunar surface. 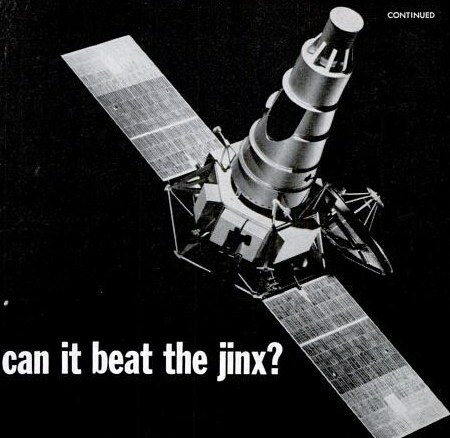 After troubleshooting and correcting issues identified on the spacecraft's predecessors, scientists and engineers were confident that this one would work -- which this article reflects. Although Ranger 6 made it to the moon, it experienced problems with its camera system and did not return any images. 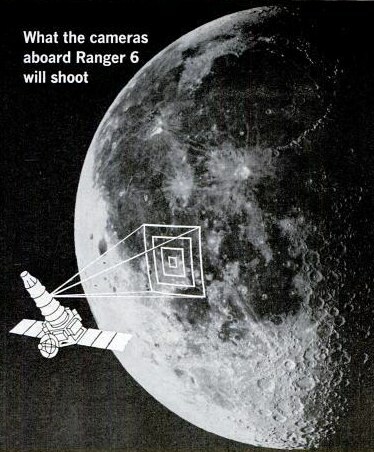 But they didn't give up and lucky number Ranger 7 was built, leading to the first successful U.S. lunar spacecraft to return images of the moon. ZERO out of 14 -- that's the astonishing record of U.S. attempts to send an unmanned spacecraft to the vicinity of the moon or crash-land instruments on its surface. Starting in August, 1958, all 14 tries -- nine Pioneer spacecraft and five Rangers -- have been unsuccessful in various ways. Defects of rocket propulsion or instrumentation have sent most lunar probes into solar orbit or allowed them to fall back and burn up in the earth's atmosphere. A few times the carrier rockets have exploded. Only Ranger 4, launched in April, 1962, actually hit the moon, but on its invisible back side. The probe's electronic brain had snapped on the way out, and its instruments were unable to transmit data. So there's a lot riding on Ranger 6, due for launch early in 1964, perhaps this month. Its mission is to crash-land in the Ocean of Storms after sending back the first TV close-ups of the lunar surface. After Ranger 5's failure in 1962, the flight of Ranger 6 was postponed. One nearly completed spacecraft was pulled from the flight-hardware line for rugged ground testing until it failed (after 12 simulated missions that would have succeeded to some degree). The spacecraft has been largely redesigned, and all parts now have to meet "Minuteman M" standards -- established for the most critical Minuteman missile components. Some NASA experts think some failures were caused by sterilization treatments of Rangers -- heat and ethylene oxide gas -- to keep earth germs from contaminating the moon. Ranger 6 has not been sterilized, although it has been assembled under clean-room conditions more antiseptic than an operating room. The theory is that radiation in space plus impact will kill microorganisms that hitch a ride; if any survive, they are not likely to propagate on the airless, hostile moon. Ranger 6 has a less complex job to do. Earlier models had a variety of experiments to perform, including separation of instrument packages that were to survive a somewhat softened impact. Ranger 6 has only one job -- taking moon surface pictures -- and it requires a minimum of maneuvering to carry out that mission. Spectacular picture-taking assignment: 3.000 shots are to be taken in the last 10 minutes of the flight, as Ranger plunges 875 mile down to its death in a 6,000 mph collision with the moon. The six special TV cameras on board, designed by RCA, have higher resolving power than any TV cameras ever carried by a spacecraft. Two of them are 800-line "full-scan" cameras -- in which the face of the vidicon tube is scanned by an electron beam 800 times to cover the picture area -- and the other four are "partial-scan" 200-line cameras. (U.S. commercial TV uses a 525-line picture. Unlike the pictures we see on the home screen, which portray movement, Ranger's shots will be television stills. Each camera's shutter will open for 1/500 second; then the image frozen on the face of its vidicon tube will be scanned and telemetered to earth. The spacecraft's radio channels don't have the capacity to handle a rapid enough succession of pictures to convey motion. Ranger 6 mounts its camera near the blunt tip of the slim cone of polished aluminum that houses its 375-pound payload. They are fixed in position at an angle of 38 degrees to the spacecraft's longitudinal axis, and stare out through an unshielded, 13-inch opening in the cone. Their lenses differ in speed and field of vision. One reason for this is to provide a wide range of possible exposures. Nobody can anticipate the precise lighting conditions the cameras will face during the crucial last 10 minutes of the 66-hour journey. Another important advantage of carrying six cameras is that it vastly lessens the risk of micrometeorites wrecking the mission. The chances of direct hits on all six cameras are slim indeed. At the start of picture-taking, the cameras should provide definition about equal to the best astronomical telescopes on earth, which can detect lunar objects no smaller than the largest ocean liner. The last pictures, however, ought to detect objects as small as a Volkswagen. It is also possible that as late as 1/10 second before impact, one partial-scan camera may be in mid-picture. There'll never be time to transmit more than half of it, but in the portion that reaches the earth scientists may be able to distinguish surface details only two or three feet in diameter. Control of these maneuvers -- and reception of pictures as well -- will be the responsibility of Jet Propulsion Lab's Deep Space Instrumentation Facility at Goldstone, Calif. Big dish-shaped antennas there are capable of beaming instructions to the spacecraft and receiving its messages. The moon surface pictures will be recorded at Goldstone on 35-mm film and on tape. JPL hopes to release some of the better photos to the press within eight hours of the end of Ranger's mission. Big schuss. Camera will start clicking as the spacecraft slides down the gravity hump between earth and moon. When Ranger leaves its parking orbit, it will be traveling at about 24,500 mph but will slow gradually to 3,550 mph, under the pull of the earth's gravity. At 4,160 miles from the moon, its speed will pick up again, influenced by the moon's gravity. That's where the terminal maneuver takes place, about an hour before impact. Fifteen minutes before impact, the electronic controls will command the TV payload to turn itself on and start warmup. By then, Ranger 6 will be 2,000 miles from the moon, and moving 4.120 mph. Ten minutes before the crash of the spacecraft, the control system will command the cameras to turn on full power and start taking pictures. Distance from the moon: 875 miles. Speed: 5,190 mph. If the control circuits should fail -- and if Goldstone is somehow unable to back them up by taking radio command of Ranger 6 -- an electronic clock above the spacecraft is primed to switch on the wide-angle, full-scan cameras only. Ten minutes later, at 6,000 mph -- WHAM!! Destroying expensive hardware is only one step in our program to find out what the moon's surface is like before human astronauts set foot there. After the Ranger series is completed, Surveyor spacecraft will land more lightly and also will be placed in orbit around the moon. Surveyor orbiters will send back pictures for detailed map making, and Surveyor landers, in addition to picture-taking chores, will analyze samples of the lunar soil. Although our probes to the moon have been monumentally unluck so far, we can't abandon them -- unless we're willing to abandon the idea of landing men on the moon. No one knows if the moon's surface is dust or crust. One scientist has even suggested that the lunar "seas" are paved with asphalt. That would be nice, but the design of a manned landing craft can't be completed until we really know.